/General /Getting Started /How can I setup a cron job? If you have problems with sending your campaigns you may have not setup your cron correctly. 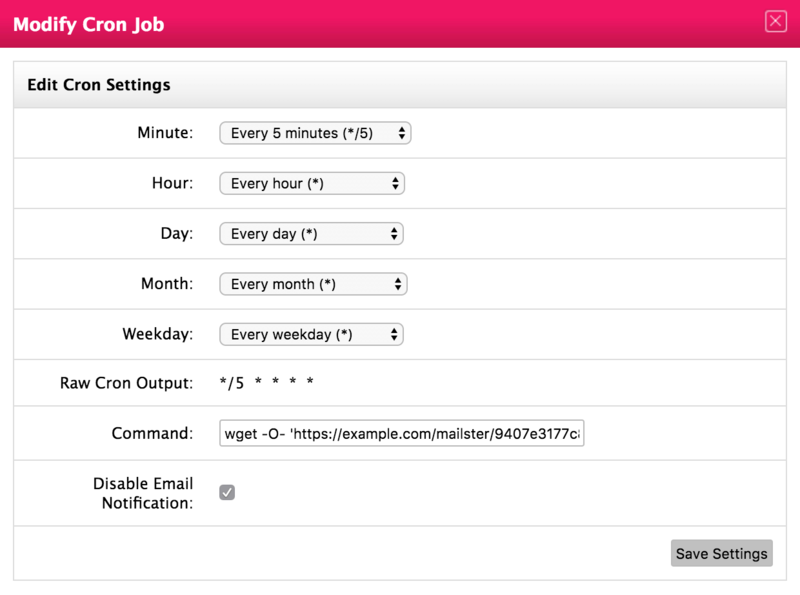 If you select the WordPress native cron solution you don’t have to take any further actions. WordPress will send your campaigns in your defined interval. This method has some downside too. Read more about in this article. The 32 digit hash are some random numbers an letters an the script doesn’t execute the send progress if this value is missing. You have to visit this URL to trigger the send progress! With your hosters cron options: Depending on your host this is slightly different. Please ask your provider how to call a certain URL with a certain interval. Some Guides are linked below. If you have an option to Disable Email Notification check that option as well so you don’t get unnecessary emails. If you setup your cron please also check if the cron is working correctly. Here are some links on how to setup a cron at the most popular hosts.